Spring Term 2014: "Sometimes Things Happen..."
This is my first update for 2015. So it’s now been four months since the implementation of the new SEN framework in September 2014 and everybody is now fully on top of things, aren’t we? Aren’t we?? I am sure that some of you reading this are already now used to doing things differently from before, so may even want to skip over this section. But, for the rest of us, it seems that we are still getting to grips with everything. Whilst some things appear to have been tweaked or have even stayed the same, there are many others, where there have been some fundamental changes. Unfortunately, I have already seen for myself in the past few months that many people (both parents and professionals) are still finding it quite hard to work out some of the changes that have happened and what they should be doing now. The most pressing things for everyone currently seem to me, to be, theoretically, the issue of everyone now ‘working together’ and, practically, the issue of transferring ‘Statements’ into ‘Education, Health & Care (EHC) Plans’. Although I provided information about the latter in my Autumn (Half Term) 2014 update, it seems to me that many people may still benefit from reading this information again (or for the first time if they did not manage to read it back then), so I am highlighting it again here. You will find it at Transitioning ‘Statements to EHC Plans’. 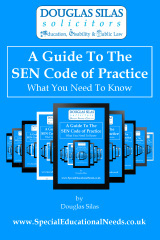 As you may know, I spent my summer break last year, working day and night to put together an eBook: ‘A Guide to the SEN Code of Practice’, so that it would be ready for everyone prior to the start of the new academic year, ahead of the implementation of the new SEN Framework at the beginning of September 2014. Although many readers of these ‘SEN Updates’ have since kindly purchased a copy, some people have told me that they haven't had the time to read it yet, whilst others have told me that they haven't bought it yet, as they know they wouldn't have the time to read it! 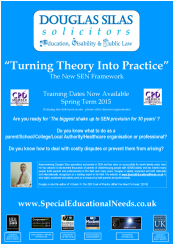 So, to try and make everyone's life a bit easier, I have now put together a 15-day email course, which tells you about the new SEN Framework/Code of Practice in 'bitesize' chunks, by way of a chapter a day of the Guide. I am sure that you will understand that, although it appears to be the same links in the text of the email course as in the eBook, most of these will not work (as they mainly link to resources in the eBook itself, or to further information on my website). So, I am afraid that if you cannot wait to find out more after reading to the end of a chapter, or if you want to be able to use the links properly, then you will need to purchase a copy of the eBook! I hope that by doing things this way, it will make everyone's life easier again. There are six dates (13/28 January, 19/24 February, and 11/19 March 2015) but, this time, rather than aiming each training day at a different audience as I did in the Autumn, there are three dates aimed at particular groups but three dates where there is no specific audience and training will be provided for everyone (including 19 February 2015, which takes place in Half-term as I know that some people working in education settings said that they were unable to attend last time). P.S. 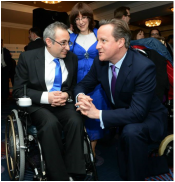 I always find it helpful to find out what people think about my updates, so please take a few seconds to tell me what you think by going to ‘Spring Term 2015 update – your thoughts’ – there are just 3 quick questions.